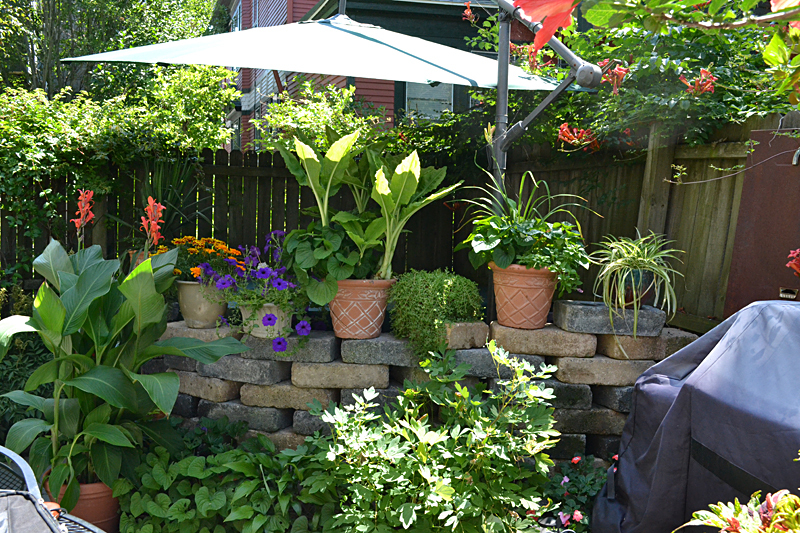 The description of this yard on the Garden Walk Buffalo map summed it up perfectly: A lot of garden crammed into a tiny space. 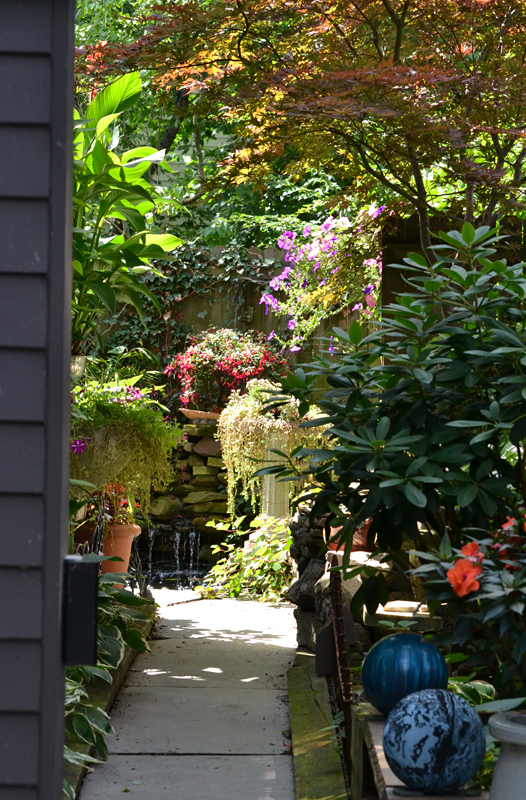 Bruce and Renée Adams of 533 Auburn, Buffalo, have a backyard that is about 36 feet wide but only 20 feet deep, yet they manage to squeeze in two ponds, a stream, a patio table and chairs, a hot tub and lots and lots of plants. I visited their home during the 20th anniversary of Garden Walk Buffalo, the largest garden walk in the United States. It featured almost 400 gardens to visit over two days for free. Garden Walk Buffalo is also one of the last events for the National Garden Festival this year. The final day of Open Gardens takes place on Thursday. The Beyond Flowers bus tour, which has an environmental focus, takes place on Saturday. And the last garden walk of the season, the Black Rock & Riverside Tour of Gardens, takes place Saturday with a daytime tour and its Starry Night Garden Tour. The photo at the beginning of this story shows the view from the driveway looking into the Adamses’ backyard. Along the right is what used to be a muddy strip that collected wind-blown trash. It actually belongs to the Adamses’ neighbor, but its location made it difficult for the neighbor to maintain. The Adamses got an easement from their neighbor to build a garden, creating an L-shaped addition to the small rectangle of their backyard. “It works for them and it works for us,” Bruce said. He dubbed the area the Lost Ruins because it includes bricks, slabs and rocks, which you can see at left. He came up with that theme simply because “In the City of Buffalo, it’s hard to throw out building materials,” Bruce said. “They won’t take them.” When he had to replace his chimney, he needed to put the old bricks somewhere. When he saw what he could do with such materials, he started looking for more. The garden was started 38 years ago and it has morphed many times as conditions changed. When the Adamses moved in, the yard was sunny, but then a neighbor’s tree grew and extended halfway across the yard. Since the only place that got sun was the along the house, they had to make the most of that space. Huge planters are set on high shelves above the back door and across the back of the house, which you can see in the photo at left. The neighbor’s tree has been removed and the yard is sunnier again, but the containers remain. Bruce said he plants up the containers on the ground then sets them in place. Since he is 6 feet 3 inches tall, using a watering wand he can reach them with little problem. He weeds them once, halfway through the summer. Trellises as well as tall plants in large containers set on the ground add to the effect. Tip: For more height, set a pot on top of another inverted pot. Bruce also likes the flexibility that containers offer– As the summer progresses, he can rearrange them and move them around the yard as needed. If one plant grows faster than other plants, he can place that pot in back. If a plant stretches out in the wrong direction, he can simply flip the pot around. 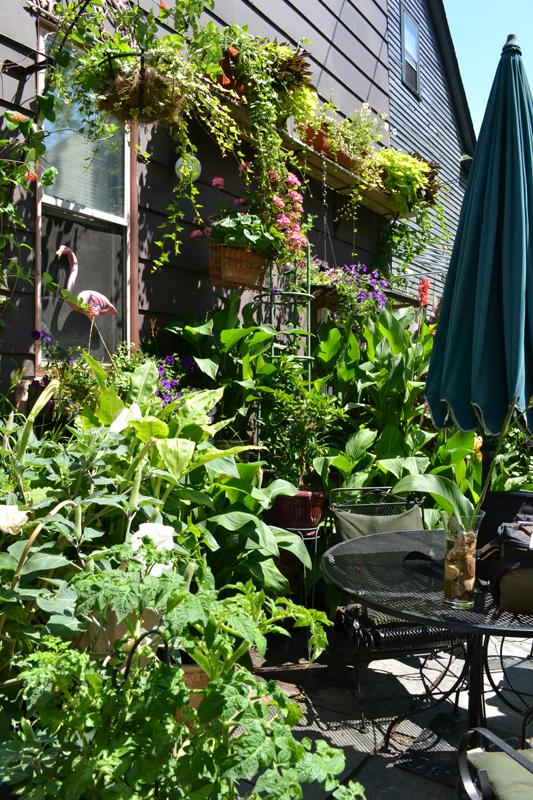 During the winter, Bruce brings many of his potted perennials into his basement. The plants can tolerate being frozen and staying frozen, which is what happens in a garden bed. They aren’t as tolerant of being frozen and thawed many times during he winter, which is what can happen in pots. 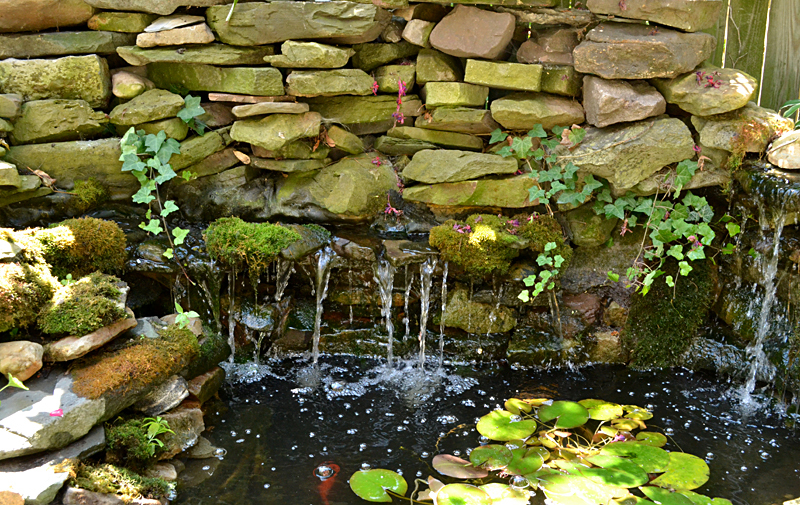 Although the yard is small, it has two ponds and a stream. The pond pictured above is in the center. Not pictured is another pond above and to the left of this pond as well as a stream flowing in from the right. Bruce, a well known artist, made the fiberglass structure that forms the infrastructure for the water feature. It’s covered with natural stone. The Adamses also have a hot tub, which is integrated into the garden. You can’t actually see it; it’s hidden by the wall and plants in the photo above. The Adamses’ garden appeals to all the senses. It’s beautiful to look at, of course, but lying in the hot tub appeals to the sense of touch. They can relax while listening to the waterfall and smelling the perfume of the stargazer lily and other flowers. “It’s an audio experience and an olfactory one, too,” Bruce said. Great photos Connie,once again. Makes me want to get back there and take more shots. The ones I have from a couple years ago look nothing like this. They have a great garden! Interesting garden. I missed that one. Lovely layout in limited garden space. 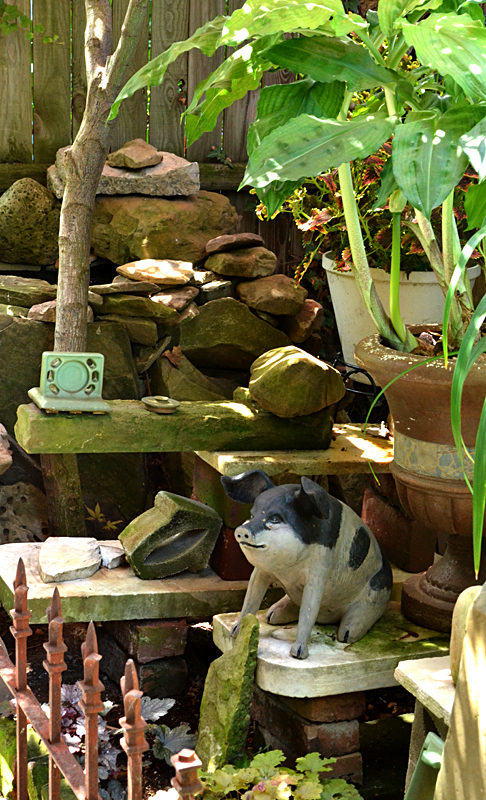 Clever use of pavers, rocks, and stones define and enhance this garden. Sharon, according to the National Garden Festival website, the last Friday date is July 25. I’ll see if I can get hold of the organizer today for confirmation. Jim, gardens are always changing, aren’t they? Thanks for the compliment on my photos. I wish I had been able to capture some views that I couldn’t quite nail, but I hope that I’ve given readers a small glimpse into this beautiful yard.